Home » Investment » Should you buy or live on rent? Buying the house is perhaps the biggest and the most common dream of every professional. 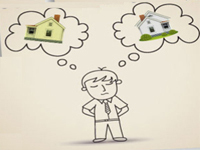 Though buying a house has high emotional quotient, it is a decision that has to be financially prudent. A wrong decision could result in excess debt and an illiquid asset. Due to increase in property prices many people prefer to rent the house. Renting is associated with expenditure. However, renting gives flexible lifestyle option, high level of mobility and is easy on the purse when compared to the Home loan EMI. A study report by ArthaYantra compares property prices and rentals in seven top cities. Know the cities in which you can buy a house and where it’s more cost-effective to rent. ArthaYantra compared the property prices with rentals in seven top cities across India, taking into account the income and saving potential of the buyer, the cost of capital, as well as the increase in property prices and rentals. 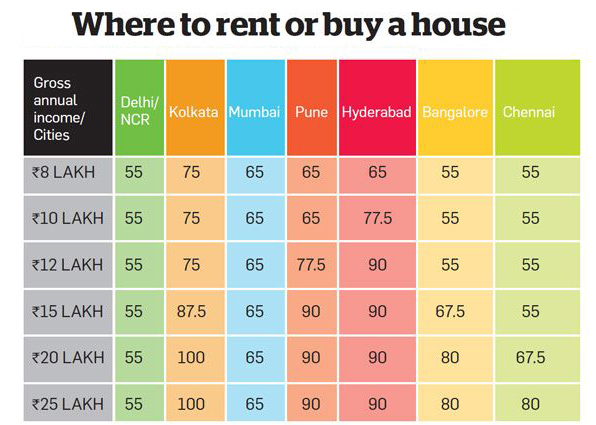 A key outcome of the study is the ArthaYantra Buy versus Rent Score (ABRS) assigned to each city. ARBS score indicates that whether it makes financial sense to buy a house or live on rent in a particular city. Since affordability is a function of income levels, the ABRS is calculated for six income levels, beginning from Rs 8 lakh a year up to Rs 25 lakh a year. ARBS score is given below. Highest score here shows that rents are very high and it is advisable to buy. Lower score means can afford to rent but can’t afford to buy. Kolkata: The ABRS score of 75 for a salary range of 8-12 lakhs signifies the fact the rental value is critically high but a professional in the salary range can’t afford to buy. A professional whose salary range is between 13 – 25 lakhs is better off owning a home than renting it. Mumbai: The score of 65 signifies that though the rents are high, it is advisable to rent because the property prices are also high. The EMI payments to be made in case of ownership are not affordable. Pune: For a professional with a salary range of 8- 11 lakhs in Pune, it is advisable to rent. A professional with a salary of 12- 15 lakhs falls in the neutral zone i.e. he can afford to buy and it is advisable to buy but have to make few adjustments to the current lifestyle in order to afford the additional amount for EMI payments. Professionals with a salary range more than 15 lakhs are advised to buy. Hyderabad: For a professional with a salary range of 8- 9 lakhs in Hyderabad, it is advisable to rent. A professional with a salary of 10- 11 lakhs falls in the neutral zone i.e. he can afford to buy and it is advisable to buy but have to make few adjustments to the current lifestyle in order to afford the additional amount for EMI payments. Professionals with a salary range more than 12 lakhs are advised to buy. monthly cost of renting is cheaper than that of buying by more than 70%. The low rental prices also mean that though a professional with a salary more than 15 lakhs can afford to buy a house, renting is a better option. Chennai: The score of 55 for a professional with a salary range of 8-19 lakhs signifies that the monthly cost of renting is cheaper than that of buying by more than 70%. The low rental prices also mean that though a professional with a salary more than 20 lakhs can afford to buy a house, renting is a better option. If you plan to buy a home, go through the excerpts of the report for more such nuggets of information. It might help you in taking an informed decision on buying a house or renting one.